Here is render that I did at the end of last year for a new house, the render is of the rear elevation. Hoping it will get built this year if we get planning permission through. Great render Nat - but I think that modern Juliet balcony is completely incongruous with the rest of the traditional timber design. It needs to be metal or timber, frameless glass just doesn't work there. Nat, can this image go public like on Face Book? Hi Dave, please feel free to use the image on social media or on the website. Jim, sorry you don't like the glass balustrade, I agree that metal of timber would certainly be more in keeping with the design, I believe the client wanted it so the view from that room which is the master bedroom is not obstructed as the view is very nice onto open fields etc. Fantastic as usual, it's great how having one window open in the dormer really gives a sense of depth. Are the roof tiles from the browser? Also, I like the Juliet balcony just the way it is. Ha. Problem with that as is, is that it needs to be spaced away from the timber, which generally means the modern stanless steel patch fixings, and they are the thing that makes it incongruous. Use slender PPC black edge channels with low reflectivity glass, and it’s not so much of an issue. Alternatively a simple, slender black steel bar balustrade would be more contextually appropriate. I have been a practicing Architect for the last 25 years and don't want to offend anyone at Podium because they perform a great service giving advice on challenges that we face using this software. There are certain times, such as this last post I've read, where the comments are critiquing the Architecture and not the use of Podium. From design guidelines and building bylaws, to client's personal design choices, we have a difficult time as it is seeing our own designs come to fruition without another level of criticism from this site. I just think the focus should be on the tools to improve our presentations and not on the design itself. I understand what you have said and essentially we post here for comments on our SU Podium skills, but I do think there is an overlap on also being given advice or critique on Architectural elements if some one has those expertise. The reason is a render of a house will never look photo realistic if the modelling of Architectural elements is not correctly done. In this case I know Jim, "Bigstick" and as a friend, I'm quite happy to hear his opinion on Podium and Architecture, as like yourself he is an experienced Architect and his opinion is based on this. If it was not for Jim's constant critique when I started posting on here in 2011 I would never have progressed with Podium the way I have. Jim has helped me a lot and I really appreciate it. So if you can take on board that Jim knows me and I happy to hear his opinion that's why I feel he said what he did. It should not put people off from posting here because we have a choice to listen to opinions or not but in Jim's case he's often spot on. Like Nat says, I know him well enough to feel comfortable stating an opinion without him taking offence! It's not only the case that he consistently creates beautiful renders, the output of the office is usually very nicely controlled, traditional and understated, and elegant. It's fantastic to see offices that really care about this level of detail, because too many people either don't or can't. I'm also a chartered architect, and I also have 25 years experience, I run an office in the UK and have been fortunate enough to have won several design awards, so I think I have a reasonable eye. I also think that no matter how good we think we are, we are all guilty periodically of missing little things. We've all been guilty of 'not being able to see the wood for the trees' and I appreciate it when people point things out about my work. We have an opportunity not only to discuss rendering, but also design periodically. Some people are happy with that, some not. I don't always raise these things. I do when I see something glaring, and it's also worth bearing in mind that a lot of work posted is by students, who might not quite understand why certain things might not work. Chances are that their tutors will see it! I'm also pickier with the people who I know better. This pickiness is intended to be me trying to help people maintain their high standards. Nat knows by now that I really like the overwhelming majority of the work he posts. It's usually designed, detailed and rendered with stunning attention to detail. I suspect in the case above, the ironmongery generally wouldn't be satin stainless steel. 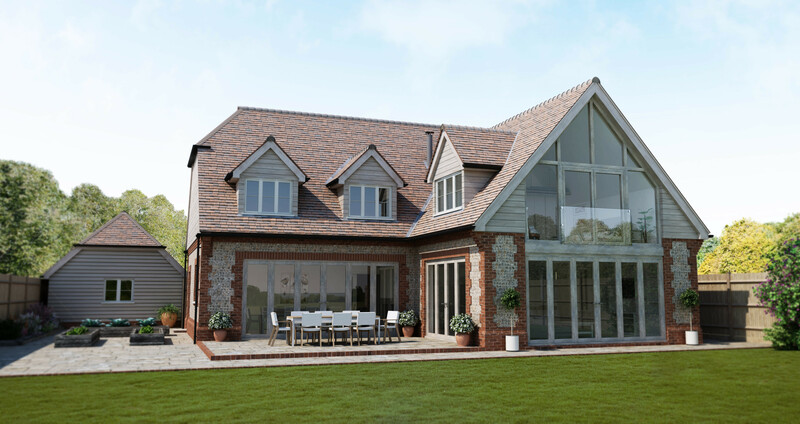 We have a very nicely-detailed traditional British vernacular design using knapped flint and plain clay roof tiles. These are quite specialist materials, and they are not cheap. Similarly we have what looks like raw untreated oak - ultra traditional, beautiful high quality finishes. In terms of the design it's a really carefully-considered traditional scheme. In the midst of all that we have a balustrade that is in effect a commercial product. I can understand that the client wants a balustrade, and that they want as little obstruction to the view as possible. I also appreciate that the idea of a frameless glass balustrade is about as minimal as you can get. However, right in the very focal point of the elevation, we have a material (stainless steel) which basically undermines the integrity of everything the design is striving carefully to achieve elsewhere.We can say, "It's just 4 patch fittings - what's the big deal?" It's a conceptual point, and one of design integrity. The client won't care, but some of us designers do. There is actually an opportunity to make those timber sections either side of the door a little chunkier and deeper (which might actually be necessary looking at how that roof is supported - probably needs that horizontal timber acting as a tie to made bigger too) which should allow the glass to fit into a rebated groove allowing a timber cover strip to be fitted. Et voilá, no stainless steel dots! In this respect then, I think it's possible to achieve all the objectives without compromising the design principles, and I know Nat's office can do it well! I really like the design, and this "glass balustrade" is obviously the client's request. So kudos, well done. 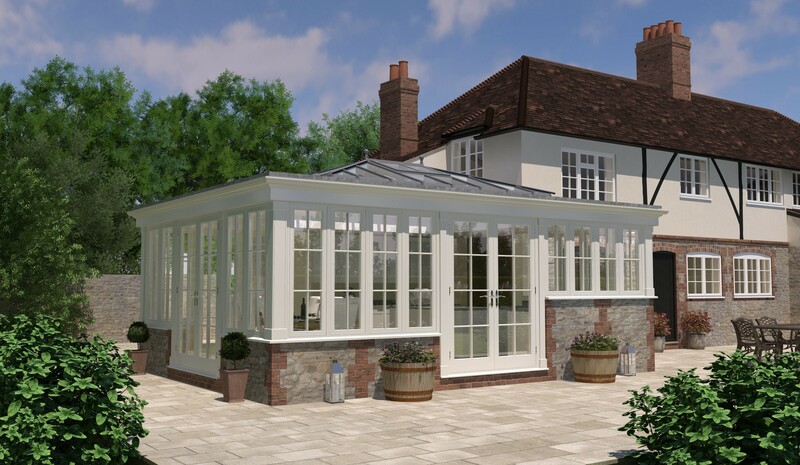 I love this render and the style of the house as well, I get to draw houses similar to this with my day job producing renders for high-end bespoke glass buildings in timber, oak and aluminium. I love the grass, It seems that good grass can cover a multitude of sins, how did you accomplish this realism? I'm guessing that you have done a fair amount of PP here, which is the one area I have no experience in and I fear is the limiting factor on the realism of my renders. I also love the way you have blurred the outside of the image to draw the eye to the house. The only thing I spotted which detracts from an otherwise amazing render is the brickwork, the brick texture is not aligned quite right meaning some of the bricks look sort of 'chopped' if you understand what I mean? Can I please get your comments on the render attached, this has not been post processed due to the above, but I would like to learn how to up my game, many thanks in advance. Thanks for your comments, its true that I have used Photoshop on this render to make it more real, but the raw render still needs to be good if your going to get any good results with PP. I think your renders and really good, they are nicely detailed. the textures are good and there's a good balance between light and shadow. The image you have attached could do with having a faint line overlay added and also some adjustments to the contrast and levels, both these things I normally do in Photoshop but Podiums PIE is also very good too. The sky in the render does not match the lighting of the scene, it needs to be lighter. The blur around the edges of my render is done with Photoshop. You will need to learn some level of Photoshop to enhance your renders, there's lots of YouTube videos out there you can learn from, I am self taught in Photoshop and just know the basics. I have attached your render with some quick adjusts I have made in PP, it would have been nice to have a line overlay as this would have really brought out the detail. I actually think your based near me, I’m in West Sussex, a lot your work looks like its in my neck of the woods. Keep working at it and your make the improvements you want to. Thanks for such a thorough reply Nat, your comments are very helpful and I really appreciate you taking the time to do some PP on my render too. I am based in Glossop, Derbyshire but all of my work is for bespoke glazing companies down south, most notably David Salisbury. There is not much business up north, we must all be comparitive paupers! Please can I trouble you with a couple more questions, you mentioned a line overlay, please can you elaborate? The sky being too dark is an issue I am aware of, I use the Podium Sky with a sky dome so I am unsure how I can lighten the sky at render stage without affecting the overall lighting in the render? Many thanks and best regards to you. Your further away than I thought but I am familiar with David Salisbury, I was sure from the materials your using the projects from more down South. For the line overlay please see the link here from the Podium website. Line overlays can also be done on Panoramic's using the Cubic VR plugin which I use all the time.